Making and selling dolls is a wonderful thing, whether you are doing it to support your family or for the school fundraiser. 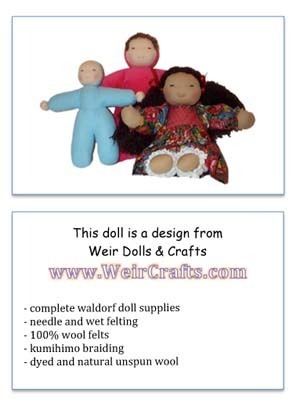 We often get requests from people interested in making dolls asking permission to use Weir Doll designs and patterns. We believe in the value of handmade waldorf dolls, and want to be as supportive as possible while protecting our designs. To use our designs and patterns to make dolls to sell, purchase and attach a hang tag on to each doll sold to identify it as a Weir Dolls design. The hang tag on the doll serves as our licensing requirement. Pack of 24 hang tags to pin or string on your dolls. Image of front and back of tag is shown on the left.